Vogue Spas and Bathrooms has the very best in bathroom vanity units and basins Gold Coast. Our Gold Coast showroom range of bathroom basins and vanity units includes all the top brands and some beautifully innovative designs and styles. Our friendly team can guide you through the best basin or vanity units for your Gold Coast home – come and take a look at the world’s best bathroom products at Vogue Spas & Bathrooms. Our friendly team provide expert knowledge and service to make your selections even easier – call in to see our full range. For over 265 years, Villeroy & Boch has stood for exciting designs and quality. 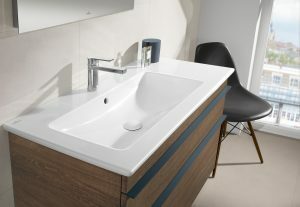 Since its foundation in the heart of Europe, Villeroy & Boch has become one of the world’s leading brands in the sanitary sector and has a long tradition in which the company played an active part in shaping bathroom culture. Call us now on 5528 0077 for more information on bathroom vanity units or use the contact form below.